What will be the amount of the annual property tax? – is among the first questions frequently asked by many potential property Buyers. This article discusses the technique for gathering information regarding tax rates and the method of calculating the property tax that will be assessed the buyer of a property. It is assumed that the property is located in California and that the transaction does not involve a Proposition 60 or Proposition 90 transfer of assessed tax base. Although the following example is for a property located in Orange County, the same techniques would apply for any California county. Each county has its own way of making the information discussed in this article available to the pubic and the reader may need to perform a little research to collect the necessary data. While following through this example, the reader may perform a mouse click on any of the accompanying illustrations to open the particular Orange County Tax Collector web page from which that illustration was taken. The property for this example was recently listed and sold through the SoCalMLS system. The address is 1723 Miramar Drive in Newport Beach and the listing price of $3,595,000 will be used as an assumed sales price. All information used in this example is easily obtainable from the combination of public records and advertising publications. Property tax charged to the owner is comprised of two parts. The first part is called the ad valorem portion and is computed by multiplying the property base tax assessment value by the ad valorem tax rate. Base tax assessment is the purchase price of the property. Under current California law, the base property tax assessment may increase each year a maximum of 2%. The second part is called the special assessments portion. This is the total of the property’s portion of special assessment bond and improvement bond payments. This amount is determined by the applicable bonds and is independent of the property base tax assessment. 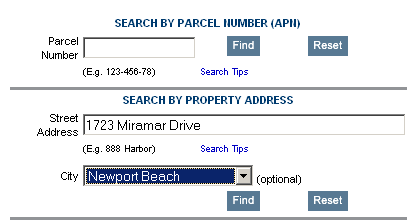 To collect the data for this example direct your web browser to The Orange County Tax Collector property search page, enter either the Assessor Parcel Number or the property address and city as shown in the following illustration. Then click on the appropriate “FIND” button. A page will open displaying the parcel number of the property as shown in the following illustration. Click on the parcel number link. The page which opens may display several lines with parcel numbers. 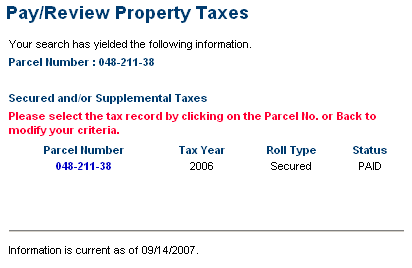 Click on the parcel number in the line which has the most recent year and does not contain the word “Supplemental”. An example of the page is shown in the following illustration. The page which opens will show information relating to the current tax bill. Look near the bottom right hand corner of the page to locate the words “Click Here for Details” as shown in the following illustration and click on that link. A page will open which displays a “Tax Rate” column and “SPECIAL ASSESSMENT USER FEES”. For this example that table is shown in the following illustration. The ad valorem tax rate is the sum of all tax rates listed in the “Tax Rate” column and is equal to 1.03956%. Therefore the ad valorem tax is then 1.03956 x $3,595,000 / 100 which is equal to $37,372.18. The special assessments portion of the tax bill is the sum of the amounts shown in the “Amount” column below the “Special Assessment User Fees” title and excluding the amount in the “Total” line. The special assessments portion for this example is equal to $184.56. 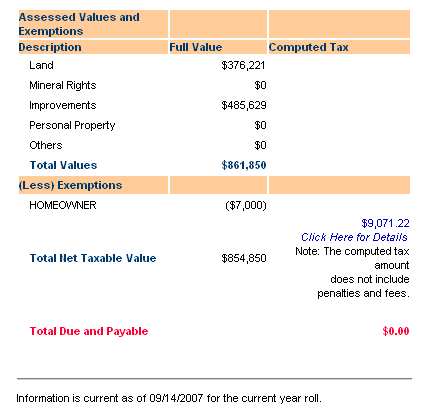 The resultant total property tax for this example is equal to $37,372.18 + $184.56 or $37,556.74. If the home owner has filed for a Home Owner’s Exemption, then the property base tax assessment may be reduced by subtracting from it the amount of the Home Owner’s Exemption prior to performing the above calculations. At the time of this writing the Home Owner’s Exemption is $7,000. The property tax question has now been answered for ANY property being considered.